※ TJK shuttle bus from Kenting to Kaoshiung is offered on 23-Feb after the closing remarks. Please sign up to reserve a seat. 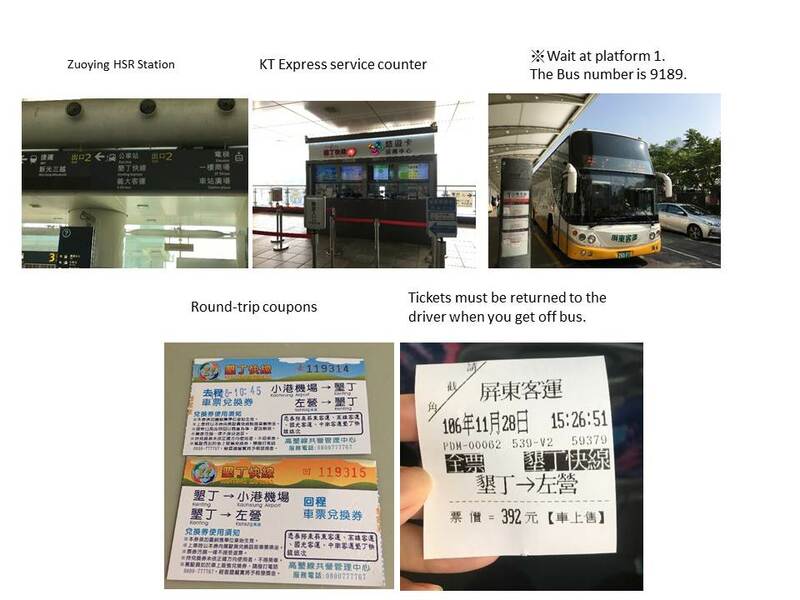 ※When you get on the bus, exchange the coupon (left photo, see below) for ticket (right photo, see below) from the driver. When alighting the bus, return the ticket to the driver. If you have purchased the return coupon, please keep it until you take the return bus. From KHH airport: first bus departs at 10:10 and last bus departs at 19:50. From Kenting: first bus departs at 8:10 and last bus departs at 19:10. ※Get off at the last stop at Kenting Xiaowan. Caesar Park Kenting (meeting venue) is across the road. 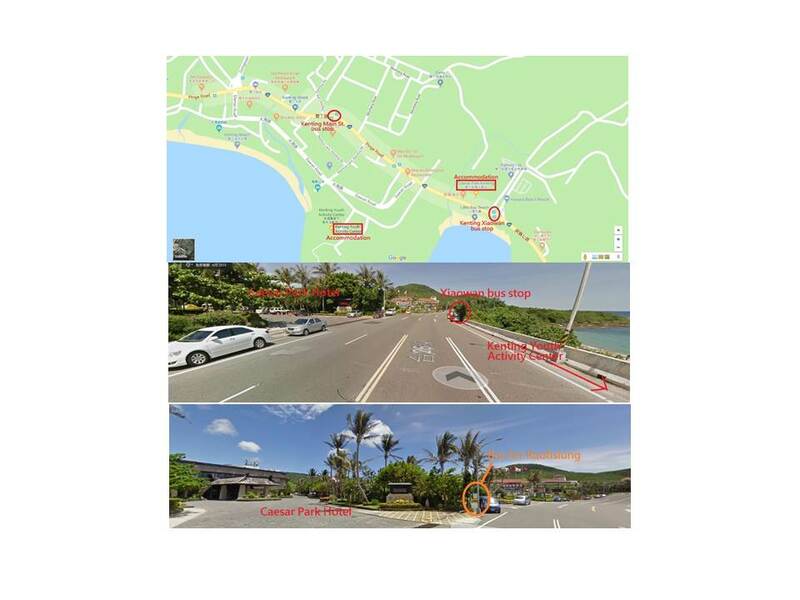 If you stay at Kenting Youth Activity Center, walk backwards about 300 meters and turn left. Walk 500 meters and arrive at Kenting Youth Activity Center. NSRRC will arrange two buses from Kenting to Kaohsiung. If you are not able to take the TJK bus, please take the return bus 9189 at the bus stop (at the gate of Caesar Park Hotel). Bus ticket can be purchased on bus. If you have already purchased the return coupon, exchange the coupon for ticket from the driver. 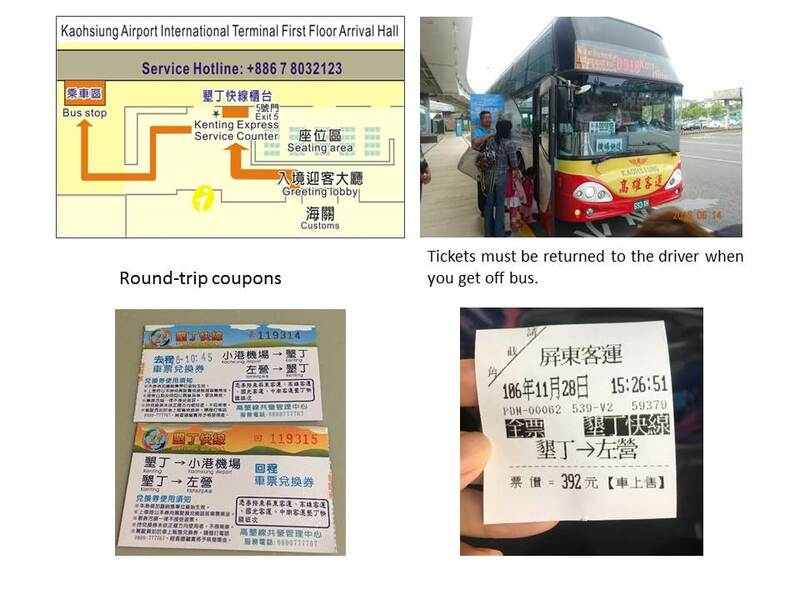 ※Bus fare from Zuoying HSR Station to Kenting: TWD 407 for a single trip, TWD 600 for a round trip. Bus tickets can be purchased at the service counter (recommended) or on bus. Round-trip ticket coupons can only be purchased at the service counter. Only cash is accepted. Ticket reservation is also available online in Chinese at http://ticket.fun2tw.com/. From KHH airport: first bus departs at 8:30 and last bus departs at 19:10. From Kenting: first bus departs at 8:00 and last bus departs at 19:10.